Mediates problems with employers and government bureaucracies. Advocates for workers’ rights, health and safety. 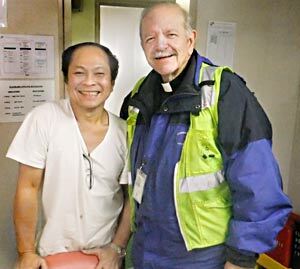 It is a sad reality that seafarers sometimes are mistreated by their employers or by U.S. authorities. Waiting to greet ships at the terminal, SCI often becomes the first line of defense for some unprotected people. Inadequate food provisions or washing facilities. No heat in freezing temperatures. Arduous and unsafe working conditions. Criminal detentions. When foreign ships illegally dump oily water (because they lack clean technology), hired seamen often are scapegoated and detained – either as witnesses or defendants – for the pollution offense. While guilty ship owners are fined, seafarers and their families remain separated during these criminal investigations that can last 10-12 months. Port security and shore leave issues. SCI helps seamen negotiate the increasingly difficult maze of port security. We provide authorized escorts for mariners on shore leave, work with CBP to extend visas for special circumstances, and find compromise with individual terminal security needs. Without the assistance of Seamen’s Church Institute, tens of thousands of law-abiding professional seafarers would find themselves captive on their ship, unable to enjoy the solace of dry land.